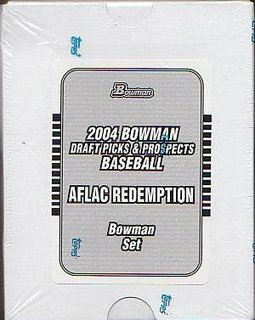 A 2004 Bowman Draft AFLAC redemption set came in the box today. I scanned the box for future reference [and because I was bored]. I'm thinking that I may try and get the cards signed one way or the other, since it is just a regular Bowman AFLAC set. On the other hand, I may want to keep the set intact. It is my only AFLAC set and I did pay about $6 for the redemption card on Ebay - it isn't worth it for me to mail the cards out willy-nilly. Note - I opened up the set and some of the cards [C.J. Henry, Andrew McCutchen] are definitely not mint. There are minor nicks and cuts that is especially noticeable with black bordered cards. 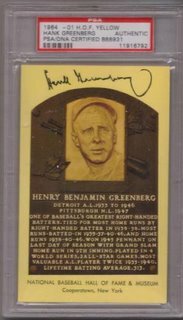 A Hank Greenberg PSA/DNA slabbed Hall of Fame postcard [$99.99 plus $3.07 s/h and $2.20 'required' shipping insurance on Ebay] arrived in the box on Saturday. One of my collection toppers that I figure to cross it off my list in the meantime, instead of waiting for a Satchel Paige PSA/DNA slabbed item or a Bill Russell certified autograph card to pop up on Ebay. 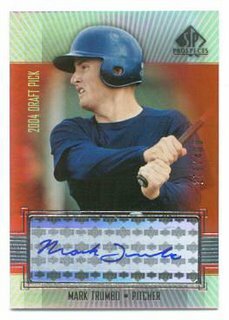 A 2004 SP Top Prospects Mark Trumbo autographed rookie card [$17.50 plus $3.00 s/h on Ebay] arrived in the box on Saturday. Trumbo maybe the next top prospect in the Angels' organization in the next couple of seasons. While I wasn't particularly enamored by the card [not having it 'in-hand' before] and I don't think it was any bargain of sort - I felt compelled to pick it up for my personal collection because it is Trumbo's best rookie card [that isn't a rookie-year parallel]. The image is from the Ebay auction I won. 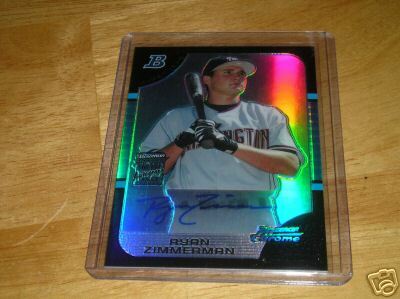 2005 Bowman Draft Chrome Ryan Zimmerman refractor autograph [$74.09 plus $2.50 s/h on Ebay] arrived in the box. It looks much better than his 2005 Upper Deck USA card, particularly the autograph [though maybe not so obvious, judging from this image - from the Ebay auction I won]. Zimmerman was on the fast track in 2005, hopefully he can establish himself as a star [hopefully in the mold of a David Wright or Scott Rolen].